When I was 10 years old, I was pretending to run my own paint store. I used to collect paint chips when I went out with my parents and I used my allowance to buy a carbon copy receipt book from Grand & Toy. My uncle Pat gave me a computer keyboard which became my cash register. I had a lot of fun playing that game, but I will admit that I always played the cashier and my friends had to be the customers. Ella Kohlmann is 10 years old and she already runs her own etsy shop, which she opened up in March 2008. I first heard about Ella from her mom, Laura, who was in one of my classes. Ella had called during the class to let her mom know that she had just made the cutest polymer kitty that would need baking when she got home. Ella makes polymer kitties, bunnies, cakes and ice cream treats. Ella manages everything about her business. 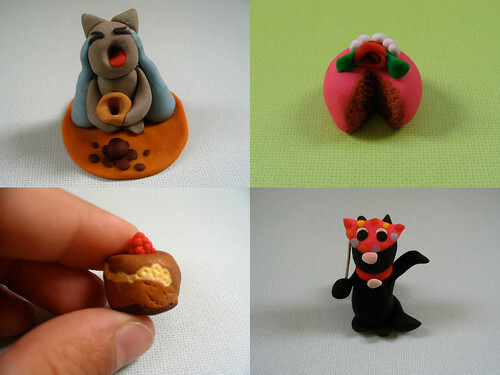 She creates her little clay creations, photographs them, writes a listing (often including a name and cute story) and posts them in her etsy shop. The only part of the process that she has help with is the baking. Her dad has been known to over-bake the polymer goodies, so her mom is in charge of baking. I’m really excited that Ella will be making her craft fair debut at the Kids Trunk Show. I can’t wait to meet her and see all her work in person. What made you decide to open up an etsy shop? ELLA: My mom told me about etsy and I thought that it looked cool so I tried it and I really liked it so I continued! Do any of your friends runs etsy shops too? ELLA: I LOVE to read, and draw. I play guitar and swim. I also act; I’m going to be in a Tim Horton’s commercial that’s being filmed this Friday. ELLA: When I come across things in my everyday life, I sometimes think, “Oooh! I could make a cat of that!” And I do! What do you think you’d like to do when you get older? Ella, i’m your class! this is so cool. make me one of these. sorry . i meant i am in your class.